We’re a company that empowers dogs to be dogs! We believe that a combination of exercise, socialization, and love makes for a happy, healthy and well adjusted dog. That is why we offer a mixture of group walks to our local mountains and beaches for your furry friend, so that they can have the freedom to be their doggy selves and we can help them fit into our urban lifestyles right here in beautiful Vancouver, BC. Super busy? Life can be hectic so why not give your furry friend the exercise he needs through us! We offer daily group walks giving your dog the opportunity to make new friends and enjoy the pack experience. We'll pick your dog up from home or the office and take him on adventures he'll never forget! 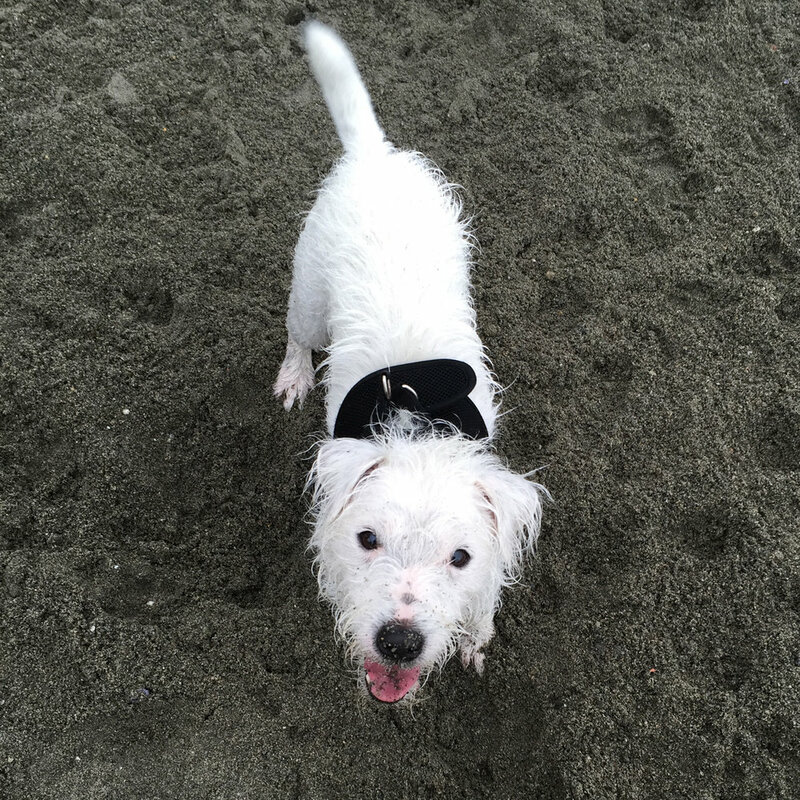 He'll get to explore the gorgeous local beaches and mountains of Vancouver, make new friends, swim, run and play to his heart's content! We'll then drop him off tired and happy and looking forward to his next Hikin' Hounds dog adventure with tail-wagging anticipation! Calling all athlete dogs! Mountain hikes for city pups! Trail walking your dog through BC's gorgeous local mountains can burn some serious energy. Nothing is better than breathing in the fresh ocean air and a good run! Send your dog with us on a local beach walk. Join the fun and follow us on Instagram #hikinhounds! "I was having serious trouble with my 7-year old Jack Russell’s recall, more and more there were times when he would get stubborn and would not come. Sometimes he would even leave the park and cross roads. Taking him to the park was getting to be stressful and worrisome. I lost him one night for about 20 minutes. I had no idea where he was, it was dark and I was scared for him. His behaviour was becoming more and more reckless. In desperation I emailed Valerie to ask if she could help with his recall. The three of us met at my place, and we spent 30 minutes or so going over recall training. Within five days, following Valerie’s instructions, I was able to take Sullivan to the off-leash park and he came when called – every time. After that I took him to the doggie beach for the real test and he passed it with flying colours! He came when I called. It was such a huge relief. Once again I have the confidence to enjoy his mischief and merry-making knowing that he is safe because he comes when he is called. Thank you, Valerie!"